Our Greatest Pain Will Be The Launching Pad For Our Greatest Calling In Life. Don’t Give Up! I remember in 2011 I came across Rebecca Hawkes online and she was one of the first adult adoptees I had ever spoken too regarding my adoption experience. She was a light for me at that time in my life and I will never forget the words she spoke to me. I recall back in 2011-2012 I was ANGRY, BITTER, MAD AT THE WORLD. I was still drinking alcohol to numb my reality and I had just began exploring with Twitter, and using the Hashtag #adoptee. This discovery took me to an entire online world of adoptees who spoke the same language as I did and I believe this had a big impact that essentially saved my life. Thank you Rebecca, I love you! I will never forget the feeling of other adoptees validating my experiences, my anger, my rage, my pain. I don’t think she will ever know how much that one statement meant to me. I always hung onto hope that even in my anger, rage and pain I would eventually become a beautiful butterfly. Over the last 6 years I’ve felt so many things, but not much of those feelings were that of a beautiful butterfly. I quit drinking on August 12, 2012 which was a HUGE thing for me. In came all the pain I was running from all those years. Feelings and emotions about adoption and life I simply had no idea how to process. It seems that every new chapter I would begin to process, a new revelation would come flooding in. I feel when I stopped drinking the fog began to slowly lift.. It took years but eventually I came out of the adoption fog, but it took time to process. I had no idea what God was going to do with my life, but those close to me always reminded me that no matter what, my pain isn’t going to go in vein. It’s going to be worth something! I was still mad at the world, and everyone in it. I HATED ADOPTION (still do) but I learned quickly that if God was ever going to be able to use me, I needed GRACE. I began to pray for grace, every single day. Over a 5 year period as I began to process my adoptee pain, little by little my anger and rage began to life, mainly because I finally for once in my life felt heard. Other adoptees were listening to me. My feelings mattered. I mattered. In return, I was able to pour out the same love and acceptance to all my fellow adoptees, the same thing that was given to me so freely. I can’t help but think of what would have happened in my life if those adoptees weren’t there to accept me and love me even in my darkest days? I’m reminded of this all the time, because I’m pretty sure I might not be alive right now. Because I was loved and accepted in the middle of my mess, anger, and rage I now have a mission in life to offer this to as many fellow adoptees as possible. It’s given me a reason to live (aside from my amazing kids) and in a way only another adoptee can understand. A few years ago, I felt like God was telling me that yes my online adoptee advocacy is going to flourish but that was not all he was calling me to do. He wanted me to reach adoptees in my city, in real life as well. What did this even mean? I can share I have never been given the gift of talking to adoptive parents or birth parents. Not that I won’t talk to them but I find them to be very triggering to me so it’s not something I feel where God is going to use me in that area. At least not yet anyway. I haven’t prayed for that gift, nor am I seeking to change anything in this area. I feel some adoptees are better equipped to work with adoptive parents and birth parents, where other’s aren’t. I can admit, if I had to I would much rather speak and share with a birth parent. Adoptive parents, I simply just can’t. Praise God for the adoptees who CAN. I’m just not there yet. One day maybe I will be. For now, my focus is and always has been my fellow adoptees. I feel such a connection with them, and mainly these connections have been made online and I’m so thankful for them in so many ways. After the last 2 years (2015-2017)of a roller coaster ride in my life, much of it being related to adoptee issues I had come to a breaking point, and if I’m honest a very dark place. I met some of my biological family for the first time, was actually accepted and welcomed and then… Emotions came flooding in that I had never experienced yet, and then a depression set in. It was a extremely hard season for me. Yes, my online adoptee community was just a few clicks away but at this time in my life, I desired more. I needed real human beings in my real life that understood me. I thought about seeing another therapist, but the thought of “THERAPYING THE THERAPIST” was just something I didn’t feel I could do. I had done this many times before, and it’s extremely difficult to not only carry all these issues, but to explain all the dynamics to a therapist was just not in the cards for me. I had no where to turn. At this moment, I felt like God was really tugging on my heart to start an adoptee centric support group in Lexington, KY and by any means necessary START THE GROUP. So I did, and this is when Adoptees Connect – Lexington, KY was created. From my heartache and pain this group was formed for adult adoptees in my city! I knew in my heart of hearts I wasn’t the only Adult Adoptee who was having a hard time in my community. I knew there had to be other adult adoptees who were hurting like me. If I had never experienced this season of deep sadness, Adoptees Connect- Lexington, KY would have never been created. This is the truth. 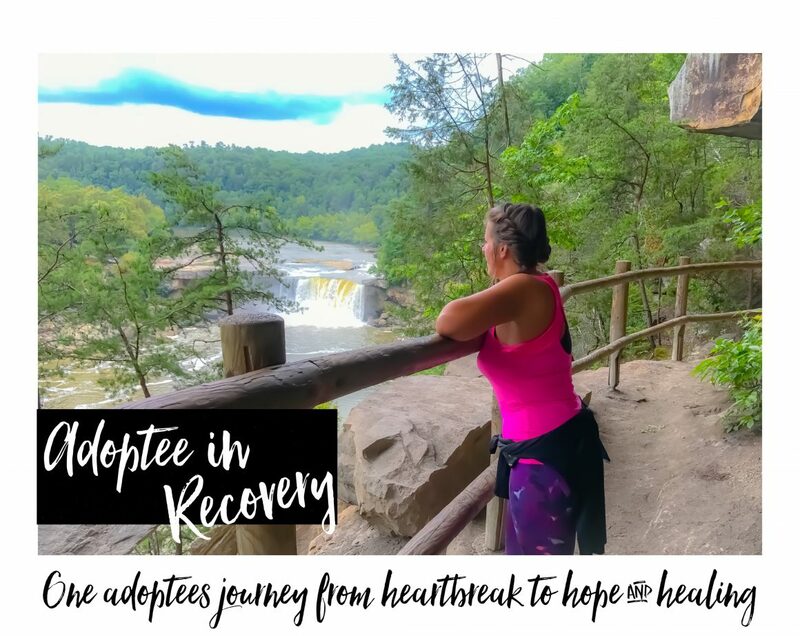 My reason in sharing this today is because I know as adoptees, we can feel discouraged, defeated and in return become very isolated in our lives. This is for the birds and I will never give up on the mission God has placed on my life as long as I know there are hurting adoptees out there who feel isolated and alone. After I started my group, a friend and fellow adoptee named Kevin Engle decided to start an Adoptees Connect – Lancaster, PA and I’ve had many other adoptees who are interested in starting a group in their city. Wouldn’t it be amazing if we could have one in every city in every state? It’s far away, but I’m never giving up on this dream happening. I have no blue print at all but what I do have is HOPE! Hanging onto hope that one day all adopted people will have a safe space to share their hearts and truth because I know from my own personal experience THIS is what is needed for us to be able to move forward in our lives! If you are an Adult Adoptee interested in starting an Adoptees Connect in your city, please leave me a message. I would love to chat with you and add your group information to our website which is Adoptees Connect . There are so many FEARS that can stand in the way of us pursuing our hearts desires, dreams, etc. I think it’s time we tell FEAR to take a back seat because it’s 2018 and we’re moving past defeat. I encourage you all to step outside of the boat and put FAITH and HOPE into action to pursue whatever vision it is you have to help move the Adoptee Community forward, and closer together. YOU CAN DO IT! Don’t wait! Your gifts, visions and talents are wanted. Do not let anyone discourage you! Well my friend, your dream is coming true! Adoptees Connect – Lancaster, PA. held its very first meeting this morning (January 13, 2018), right on schedule. We actually beat Adoptees Connect – Lexington, KY. to the punch by several hours. Only two people were in attendance, but one of them drove 40 minutes to be there! The two hour meeting flew by, we agreed to meet again next month, and I think I might have made a new friend. Thank you for allowing me to come along on your ride Pamela. Thank you, Thank you! This is exciting for sure and because of your willingness I feel like I’m not alone as the adventure begins… Can’t wait to see what is going to happen and how these groups form all around the USA and even in other countries. Hi Stacy, you don’t need to be afraid, you’ve already done the hardest part, you’ve survived adoption! All you need to be willing to do now is share your truth. There is no right or wrong in that, and nobody can take your truth away from you. Thank you for sharing with me. I’m so glad you have found my blog and have been able to relate in some ways. I agree with you about connecting with other adoptees being essential. I’ve always connected online until now. It’s wonderful to connect online, but in real life is a totally different thing. I need my peeps in real life also. I mean if you think about it, we only spend so much time online a day. I was finding myself feeling very isolated even when I have hundreds of adoptees online I’m in contact with… So the real life connections are so needed.